Artichokes are delicious but are a pain to cook from scratch. The good news is that you can get the great taste of artichokes without any of the hassle thanks to our Pastamore Artichoke with Rosemary Linguini. The artichoke hearts linguini is available as regular pasta as well as gluten-free. The dish is so tasty that your family or friends will think it was delivered. 1. Heat grill over medium-high heat. Heat a large pot of water on the stove over high heat and bring to a boil. 2. Drizzle 1/2 Tbsp of olive oil onto pork chops and season with salt, black pepper, garlic powder, rosemary, and red pepper flakes. Add pork chops to grill. Cook to desired temperature, turning once during the cooking process. 3. Heat large non-stick pan on the stove over medium heat. Once hot add 1/2 Tbsp of olive oil and green beans. Season to taste with salt, black pepper, and garlic powder. Cook until tender. 4. Add Pastamore Artichoke Hearts Linguini to boiling water. Cook until al dente and drain using a colander. Return pasta to pot and add Pastamore Bruschetta Tapenade and 1/2 Tbsp olive oil. Season to taste with salt and black pepper. 5. 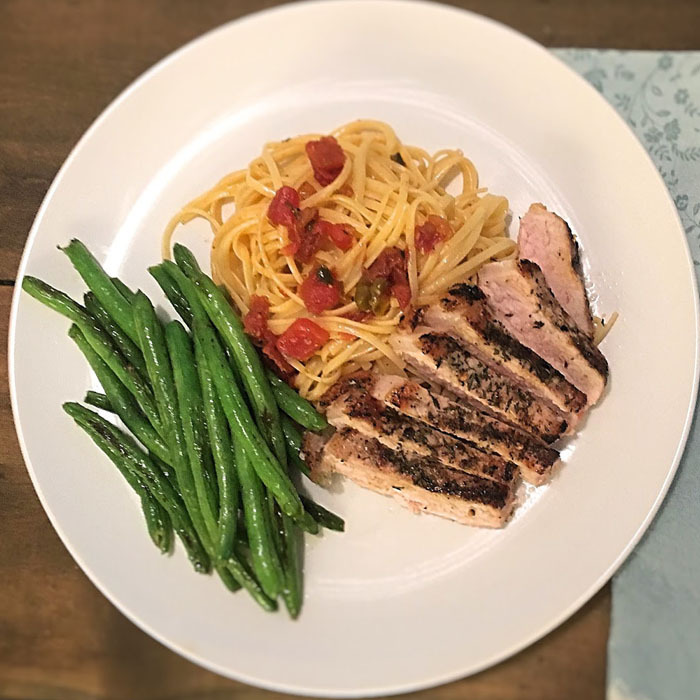 Plate pasta, pork chops, and green beans.